The ruling Government, Democratic Progressive Party (DPP) is succeeding of not compensating Malawi Young Pioneers (MYP) for great work they did in developing the country. The development comes after some quarters through their greedy hearts have brought forward, in no doubt by ruling government to convince the nation that they are ones worth to be compensated as they suffered a lot under MYP. Charles Mwenifumbo who represents Malawi Returnees and Political Detainees said they also need to be compensated for the pains they endured at the hand of MYP. “As victims of government in the one party era, it is us who need to be compensated. Surprisingly the people who bullied us around are the ones getting compensated,” he said. While some groupings within the DPP die-hard supporters are accusing Malawi Congress Party (MCP) considering them to be in right position to compensate MYPs. But the problem in both line of thinking is that, they chose to forget that MYP was established under the act of parliament in 1963. It was a government entity, not just as MCP wing. It was modeled after the Ghana Young Pioneers and the National Service Brigade of Israel. Its main aim was to train rural youth with various skills so that they could “spearhead” the country’s development. Frankly-speaking, MYP was not just like party cadets, was under Malawi government goal to involve youth in the county’s development. 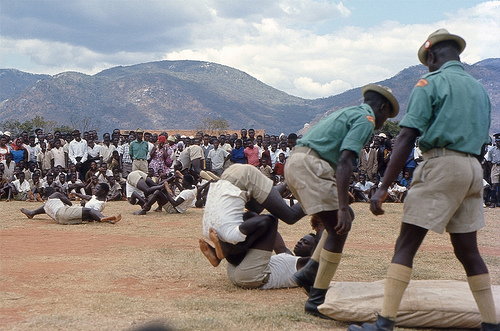 The original purpose of the MYP was to engage the youth in carrying out voluntary activities for Malawi’s development. The MYP played a major role in the socio-economic development of Malawi, particularly, in agricultural activities. The MYP, an affiliate of the Malawi Congress Party (MCP), engaged the youth through a national youth service program. However, they also functioned as a militia group and intelligentsia network for President Banda. The MYP carried out various economic activities that positively impacted socio-economic development. Only problem came when Kamuzu Banda only used to trust MYP as they operated as a parallel security system above the Army and police. MYP must be compensated, they did a lot for the nation, not be only nitpicker.